One year ago I decided to start a meetup group called edupreneurs Madrid. My intention was to gather professionals with interests in education on a weekly basis. They will talk, discuss, collaborate around educational topics and help driven the change that this field needs. The people that come to the events are very diverse: from teachers to entrepreneurs, researchers, and even fathers and children. The focus of the group is on educational innovation: not just technology, not just pedagogy, but practical innovation. One of the main motivations that drove me to create the group was the poor impact of the outcomes of university research. For several years I worked as a researcher in Technology Enhanced Learning (my half-way PhD is in this topic). And I wondered why those awesome research results from several projects and initiatives ended up archived in a folder. Your main motivation as a researcher (due to the way you are evaluated) is to write and publish papers in journals with impact. Once published, everything is done and you have to continue with new experiments to develop new papers. But there are no incentives to take these results to the market. To create real impact in the society. On the other hand, I have been in contact with part of the entrepreneurial scene in Madrid thanks to Tetuan Valley. And I discovered the importance of innovation for startups. Innovations are key to differentiation from competitors and to create entry barriers to the market niche they are aiming at. Some of those research results archived in a folder could be used to empower a startup. But these connections between universities and companies have taken place just in sci-fi movies… until now. Education is the last piece of the puzzle to define my motivations to create edupreneurs. I have been working in education-related research and projects since 2009. I entered this field by chance (my background is technological, totally unrelated to education) and fell in love with it. The group is focused on this topic because I want that the education entrepreneurs scene grows. Because it’s what I want to do. Growing the number of startups and projects is good for the ecosystem. There will be better opportunities for everyone: projects, funding, etc. Thinking deeply, I can find several sources of my fascination about education, and educational technology concretely. And being a multi-billion market is just an anecdote. Firstly, I really enjoy teaching since I remember. Being a child when asked about my future profession I said: “I want to be a Maths teacher” (weird, right?). I used to taught summer courses in my village in my last high school years. More recently, I have been teaching undergrads in the university for several years and enjoyed it so much. My second source of motivation is my son. I want him to grow up in a better educational system than I grew up. I will do whatever it takes to make him autonomous and self-directed. The rest, he will do by himself. Thirdly and finally, education is a very powerful tool for the society that needs a deep change, a change of scenery. But this change is a very complicated to accomplish. It’s a complicated problem. And that motivates me even more. There have been lots of initiatives trying to revolutionise education. Most of them have failed. The agents are disrupting education come from several fields. They have a multidisciplinary profile. Because just pedagogy is not enough. Just excellent technology is not enough. Individuals solving this complicated problem are in the middle of several disciplines. In the core of the battle. And they only will succeed if they battle together. 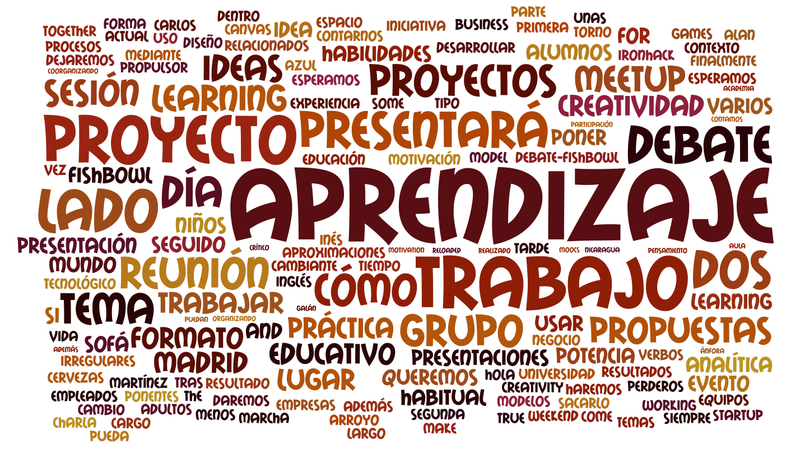 Back to the edupreneurs Madrid meetup, here are some of the topics addressed in the last meetings. Which, by the way, are not typical unidirectional talks. We predicate with the example, organising workshops and debates. And going for the practical as much as possible. This meetup is for the education community in Madrid. It’s the community who proposes topics they want to explore. They are also the main beneficiary. To conclude, I want to encourage you to come to one of our sessions. If you ended up reading so far, I guess you’re interested about education. Therefore, you will enjoy the meetup. It will be fun. You will learn a lot. And contribute. And participate. And you will be able to say that you contributed your bit. That you joined forces with like-minded edupreneurs and changed the status-quo. The change is possible. But it depends totally on people like you.